Today Jeff Atwood commemorates 10 years of CodingHorror.com. Congratulations Jeff! But as I read that a thought occurred to me. Haven’t I been blogging as long as Jeff, albeit much less successfully? I mean, just look at the intro to his post and compare it to the intro to this post. His is way better. WAY BETTER! And sure enough, I started this very blog you are reading (thank you for your patronage!) one day after CodingHorror posted his first blog post. I started on February 3, 2004 with this exciting post about, well, the blog itself. Jeff and I didn’t know each other back then but we became friends through blogging and at one point I tried to hire him to a company I co-founded but he wisely said no and went on to great things. This is why I love blogging. The community and serendipitous interactions that result have been a big part of my growth in the last decade. Yes, there’s nothing more boring than blogging about blogging (other than blogging about blogging about blogging). As I’m doing right now. But this blog doesn’t contain the full extent of my blogging history. I had a blog long before this one. I was reminded about it when Zach Holman wrote a great post entitled Only 90s Web Developers Remember This. I’m not yet 90 years old, but I do remember the practices he highlights. In fact, my previous blog perpetrated some of them. 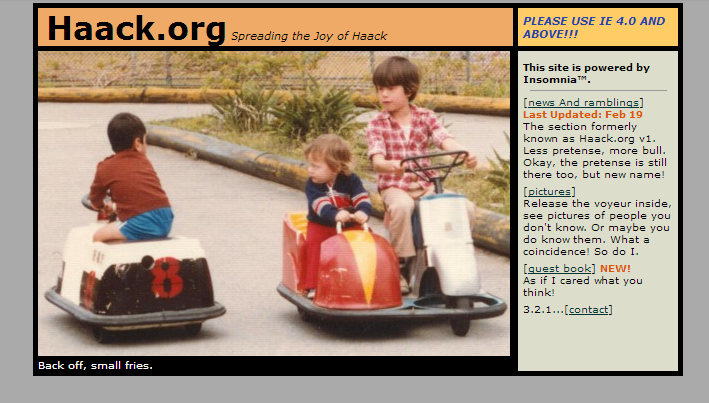 I used to keep a blog at haack.org which no longer exists except in the great internet graveyard in the sky, The Internet Archive Wayback Machine. Here’s the homepage of my very first blog. Digging this up and seeing that IE 4.0 disclaimer made me laugh out loud in light of what Zach writes about IE. It’s come to my attention that people today don’t like Internet Explorer. I can only believe they hate Internet Explorer because it has devolved from its purest form, Internet Explorer 4.0. See, I knew perfection even back then. 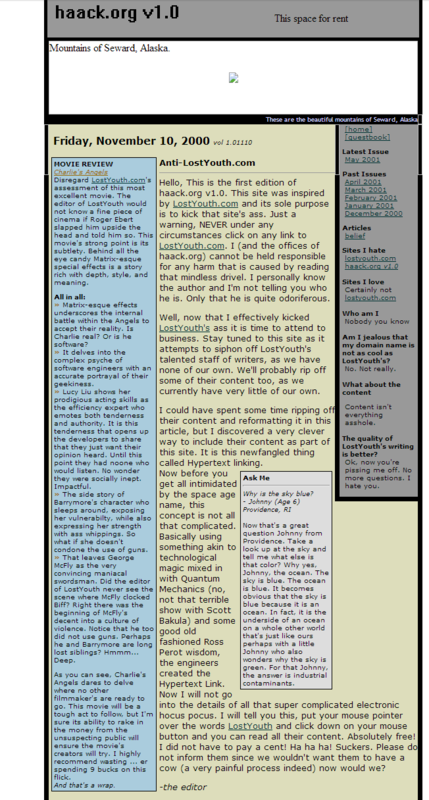 And here’s a shot of my very first blog post way back in November 10, 2000. Over 13 years ago! The header image wasn’t broken back then. I’m still proud of that deep review of Charlie’s Angels. If all goes well, I hope to be blogging for the next 10 years. And hopefully there will be something in here that’s interesting or useful to some of you in that time. Thanks for reading! Congrats! There are a lot of bloggers that I would assume have hit the 10 year mark. I wonder if Rob Conery hit the 10 year mark yet. I can remember him being one of the first bloggers (in the technical space) that I read. Kudos! I really like your posts. You spelled "descent" wrong in your review. kthxbai.